Debbie Watts, of BrightStar Care of North Hills/Pittsburgh, receives Northeast Caregiver of the Year recognition and wins BrightStar Care National Caregiver of the Year. I want to thank Debbie for her dedication and hard work and I and everyone from the office could not be more proud that the Northeast region nominee and national winner came from our office. 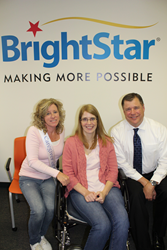 BrightStar Care of North Hills/Pittsburgh’s Debbie Watts was recently named Caregiver of the Year for the Northeast region, one of only four regions and BrightStar Care National Caregiver of the Year. Each year, BrightStar Care reaches out to the people that have been touched by their caregivers and asks them to share their experiences, and if they see fit to nominate their caregiver for Caregiver of the Year. Hundreds of nominations are submitted nationwide, and a team of judges from BrightStar corporate reviews the nominations and makes a final selection for the Regional Caregivers of the Year. BrightStar Care of North Hills/Pittsburgh provides quality home care and medical staffing solutions to families and businesses. Its home care agency services include companion care, skilled home care, Alzheimer’s and Dementia care, personal care, child care, and more. For more information, please call (412) 369-5100, or visit http://www.brightstarcare.com/north-hills-pittsburgh.